Between THE ADVENTURES OF ROBIN HOOD with Errol Flynn and ROBIN HOOD with Russell Crowe, this big widescreen adaptation is probably the best of both worlds. Not as claustrophobic as the Flynn one but not as grubby and uninspired as the Crowe one. I love the look of this CinemaScope version best. It has a nice expansive feel to it. As in many Hammer films of the period, the story or screenplay is not that memorable but it's a fun film to watch, certainly in widescreen. Sony finally released this Columbia pictures production on DVD. I remember this movie and this is by far my all time favorite Robin Hood. 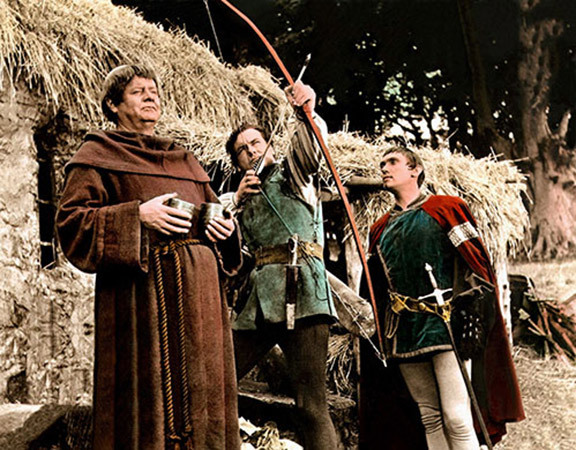 Richard Greene also played in the TV Series Robin Hood which if you as young child growing up in the 1950's would be watching it every week and knew the theme song by heart, plus got all the toys that were out on the market associated with the show. I've ordered the DVD and can't wait. The early 50s Disney ROBIN HOOD is bliss too, with Richard Todd and a good cast of regulars including Martita Hunt as Queen Eleanor. It certainly beats that glum grubby Russell Crowe travesty.